Did you know that Australia is home to about 170 species of land snakes— of which 100 are venomous? And that the top three most venomous snakes in the world live on the continent? YIKES! It's true that most snakes would rather slither away from humans than fight them, but when bites occur, it's usually when a snake is startled, or when a human is trying to kill a snake or show off by getting too close. "Snakes don't perceive humans as food and they don't aggressively bite things out of malice. Their venom is used to subdue prey that would otherwise be impossible for a snake to eat," says Dion Wedd, curator of the Territory Wildlife Park, NT. "If their only escape route is past a human with a shovel, then they are likely to react in the only way they can." 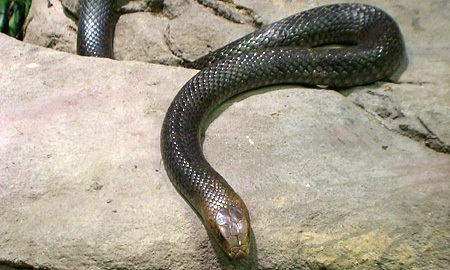 The Red-bellied Black snake (Pseudechis porphyriacus) has a widespread distribution in eastern Australia (though not to Tasmania) occurring in swamps, forests, woodlands, and even urban areas in the region. It is one of the few large venomous snakes still found in the Sydney region. This species more commonly resides near dams, streams, and billabongs. They are even capable of staying submerged underwater for more than 20 minutes. Although not particularly aggressive, when threatened it will flatten its body and hiss loudly. 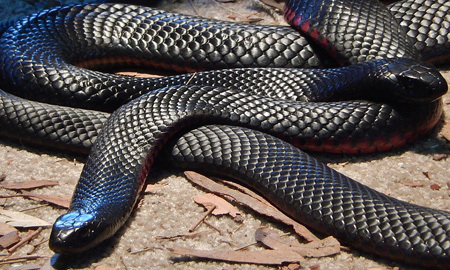 Red-bellied blacks are somewhat less venomous than many other Australian snakes, but its bite is certainly no picnic, causing significant illness and requiring medical attention. The venom causes blood-clotting disorder and muscle and nerve damage, enough to knock you off your feet. 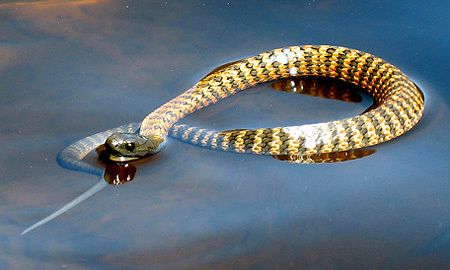 The venom of this snake is a toxic cocktail of myotoxins, neurotoxins, and hemotoxins, so it is always necessary to treat the snake bite with antivenom, even though most bites are not fatal. The common death adder (Acanthophis antarcticu) is an ambush predator capable of delivering a lighting fast attack in less than 0.15 seconds! It usually sits motionless, concealed in leaf litter, sand or gravel, twitching the worm-like lure on the end of its tail to attract prey. Found in Queensland, New South Wales, Victoria, South Australia and southern coastal regions of Western Australia, the Common Death Adder reacts to a threat by freezing and camouflaging into its environment. They are recognized by their broad triangular head and stout body, and possess the longest fangs of any Australian snake. Unlike other snakes that flee from approaching humans crashing through the undergrowth, common death adders are more likely to sit tight and risk being stepped on, making them more dangerous to the unwary bushwalker. They are said to be reluctant to bite unless actually touched. 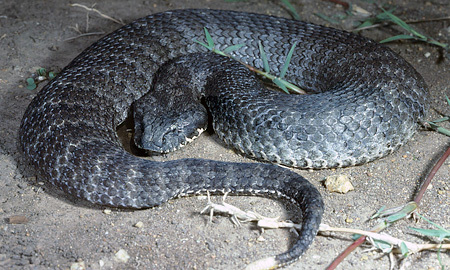 About half of death adder bites proved fatal within about 6 hours of being bitten— before the introduction of antivenom. The venom contains a type of neurotoxin which causes loss of motor and sensory function, including respiration, resulting in paralysis and death. A venomous species of Australian snake, the Eastern Small-eyed snake (Cryptophis nigrescens) has a widespread distribution from the northernmost parts of Queensland to southern parts of Victoria. 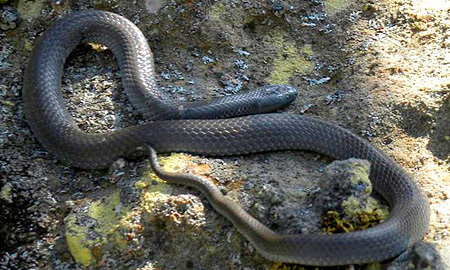 This petite snake is found in a wide variety of habitats ranging from coastal areas to mountains. Though common, small-eyed snakes are secretive night-dwellers and therefore don't often come into contact with humans. Coloured black or dark grey with a silvery belly, they blend into the night. You will rarely encounter it during the day. When disturbed, they may thrash about aggressively. The Eastern Small-eyed snake produces a highly potent myotoxin with the capability of paralyzing muscles (including the heart muscle) for days after the bite. 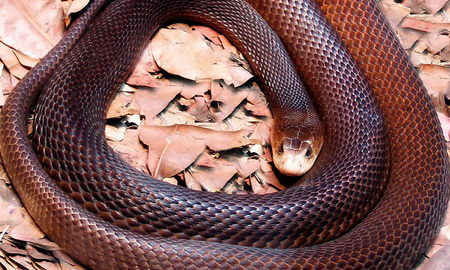 With a powerful neurotoxic venom that can easily kill an adult human being if delivered in sufficient amount via a bite, the Lowland Copperhead (Austrelaps superbus) is definitely to be avoided. The snake is found in areas with sparse vegetation near water bodies where prey species like frogs and lizards are available in plenty— in relatively cool and cold climates in south-eastern Australia, southern Victoria, Tasmania and the islands of Bass Strait. A water lover, copperheads snakes are at home around dams, soaks, canals, drainage ditches and along the verges of roads. Unlike many snakes, Lowland Copperheads have adapted to colder climates and are the only venomous species found above the snow line. Copperheads are shy and prefer to avoid humans, though they live in populated and agricultural areas. If cornered, they will hiss loudly, flatten their body and flick or thrash about. With further provocation they may lash out, but generally are not aggressive unless startled or cornered. The third most venomous land snake in the world, the Coastal Taipan (Oxyuranus scutellatus) is found along the east coast from northern New South Wales to Brisbane and northern Western Australia. Though its name suggests its location near the coast, it can also be found hundreds of kilometers inland from the sea shores.They are fond of sugarcane fields, and are equipped with the longest fangs of any Australian snake. Extremely nervous and alert, they put up a ferocious defence when surprised or cornered, "freezing" before hurling their lightweight body forward to inflict several lightning-fast snapping bites. Before the introduction of a specialised antivenom in 1956, taipan bites were nearly always fatal and caused many human deaths, sometimes within 30 minutes to 2.5 hours after a lethal bite. The venom affects the nervous system and the blood, with nausea, convulsions, internal bleeding, destruction of the muscles and kidney damage. The snake is also infamous for almost always delivering sufficient venom to trigger death in its victim. 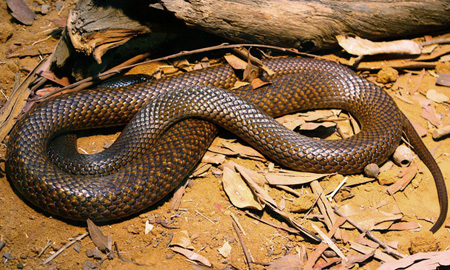 The Inland Taipan (Oxyuranus microlepidotus), also referred to as the Fierce Taipan, is reclusive and rare. 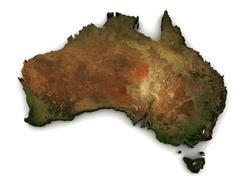 It hides out in its remote, rocky habitat in cracks and crevices in dry rocky plains where the Queensland, South Australia, New South Wales and Northern Territory borders converge. This snake only makes the top 10 because of its highly toxic venom, considered to be the most potent of any land snake in the world; it has the potential to kill an adult human within 45 minutes and is highly feared in Australia for its deadly venom that is lethal in very small volumes. The venom produced by the snake contains neurotoxins, nephrotoxins, myotoxins, and hemotoxins as well as has hemorrhagic properties. If left untreated, the bite victim is almost always sure to die in 80% of the cases. Death might occur within 45 minutes of envenomation with respiratory failure being the primary cause of death on most occasions. It will inject more than 40,000 times the amount needed to kill a 200g rat. 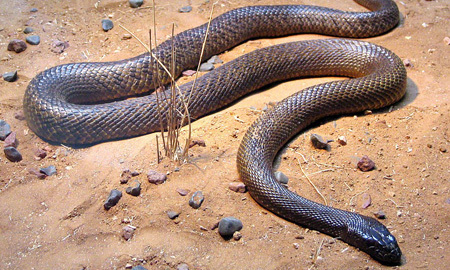 The Inland Taipan is considered the most venomous snake in the world! The Mainland Tiger snake (Notechis scutatus) are found near water bodies and wetland areas with high prey density in the south-eastern coast of Australia, from New South Wales and Victoria to Tasmania and the far corner of South Australia, including some metropolitan areas of Melbourne. Tiger snakes are a protected species in most Australian states, yet responsible for a large number of snake bite cases in the country and have a mortality rate as high as 40% to 60%. It is known for its powerful venom which is a toxic cocktail of myotoxins, neurotoxins, and blood hemolyzing and coagulating agents. Bites are fatal if untreated, causing pain in the feet and neck, tingling, numbness and sweating, followed by breathing difficulties and paralysis. The venom also damages the blood and muscles, leading to renal failure. Adult snakes are usually (but not always) banded, with ragged stripes varying in colour from pale yellow to black along a solid, muscular body that can grow to 2 m. When threatened, they flatten their necks and strike low to the ground. They are attracted to farms and outer suburban houses, where they hunt mice nocturnally and can easily be trodden on by unsuspecting victims— which is why it is always a good idea to wear snake gaiters that protect from your ankle to your knee. 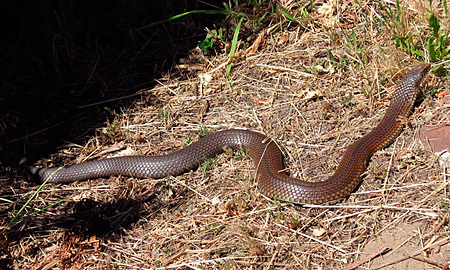 The Gwardar (Pseudonaja nuchalis), also known as the Western Brown snake, has a widespread distribution over most of mainland Australia – absent only from the wetter fringes of eastern Australia and south-western Western Australia. It favours dry habitats as well as eucalypt forests, woodlands, and grasslands. While its venom isn’t as potent as its eastern cousin, the Western Brown delivers a bite with three times as much venom, producing a toxic cocktail of neurotoxins, procoagulants, and nephrotoxins that can trigger severe envenomation symptoms in humans including nausea, abdominal pain, headaches, and kidney damage. Said to be less aggressive than its eastern cousin, the western brown snake is still one of the most venomous species of snakes in the country and causes the most fatalities in Australia. Western browns tend to be fast moving and nervous in temperament. When disturbed, they will run for cover, striking quickly if cornered, then make a quick getaway. #1 Eastern Brown Snake - Most Feared Snake in Australia! The Eastern Common Brown snake (Pseudonaja textilis) is found all along the eastern coast of Australia from Queensland to Victoria and then continuing south into South Australia, and also in some parts of Western Australia. 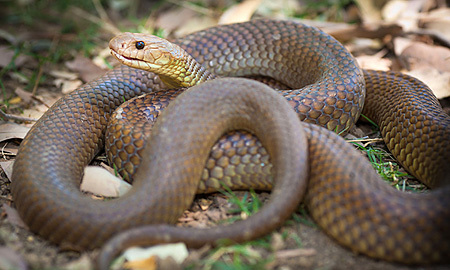 Fast-moving, aggressive and known for their bad temper, eastern brown snakes, together with other browns, are responsible for more deaths every year in Australia than any other group of snakes. Not only is their venom ranked as the second most toxic of any land snake in the world (based on tests on mice), they thrive in populated areas, particularly on farms in rural areas with mice. The venom of this snake is highly potent, consisting of a mix of neurotoxins and blood coagulants, but the "good" news is that the snake usually delivers a low volume of venom during each bite. Adults can grow to two meters and when threatened, will raise its body off the ground, creating an ‘S’ shape.